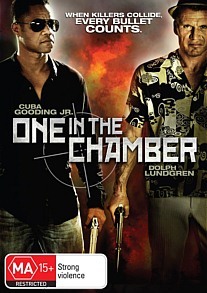 One in the Chamber DVD Review Not the greatest story ever told, but it warms the heart to see Dolph Lundgren still (literally) kicking around. Nothing hearkens back to the big action blockbusters of the 80’s and 90’s like a shootout with twin uzis. One in the Chamber is full of details like this- let’s call them tributes instead of cliché’s- because it feels like a homage to all those loud, violent movies of decades past. Think cheesy one-liners. Think waves of bad guys, who’s only purpose is to get mown down by the protagonists’ bullets. There’s even a scene where a character is being choked on the ground, and feels around until he finds a heavy vase to smack his attacker over the head with. Cuba Gooding Junior plays Ray Carver, an American assassin living in Prague who works for one of the big crime families. When Carver botches a hit on a rival family, the ensuing turf war threatens the entire city. Another assassin going by the name of ‘The Wolf,’ (Dolph Lundgren) is called in to clean up, which basically means liquidating everyone involved. The film was never going to win any awards for its screenplay, but there are a few nice twists and turns, and it does keep you guessing right up until the end. Will the war between the assassins get out of control and spill out onto the streets? Or will they team up and deal out some old-school punishment to their scumbag bosses? There’s the token love interest as well, but this takes the form of an awkward, Stockholm-syndrome-like attachment and never gets rolling. At the start of the movie you’re introduced to all the main players in the crime families, but they’re all thugs in charcoal grey suits with dodgy eastern European accents, and before long you’ll forget who they are. Some narration is supplied by Cuba Gooding Junior, but it’s Lundgren who steals the show here. He looks completely comfortable in the role of ultimate badass, donning a loud shirt and a silly hat as he dishes out one-liners and wades through the bad guys. Thanks to the historic and colourful scenery in the Czech capital, this is a visually interesting movie. However it would have been nice if those bright, bold colours had been put to more use, and if less of it was set in crumbling apartment blocks and alleyways. The musical score is workmanlike, but let’s face it, it’s the sound of the guns that’s important here. These all sound great, from the crisp pop of a 9mm to the angry burble of a submachine gun. Behind the scenes: This contains a couple of brief interviews and some on-set footage, but it’s presence can be considered token at best. For a lot of the world, the uber-violent action blockbuster is a disturbing relic from the past, and would be better off forgotten. But people of a certain age bracket, who grew up on this stuff, will dig it. Not the greatest story ever told, but it warms the heart to see Dolph Lundgren still (literally) kicking around.